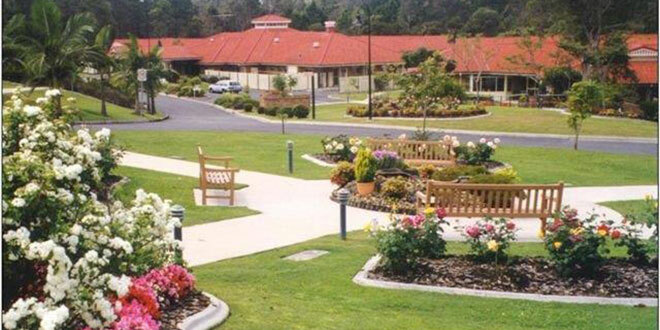 Caring environment: The St Paul de Chartres Residential Aged Care and Retirement Units are set in beautiful gardens and peaceful surroundings. ST Paul de Chartres Residential Aged Care and Retirement Units are owned and operated by the Sisters of St Paul de Chartres – Australia. The sisters are well known in the Brisbane community for their years of dedication serving the aged which has led them to achieve their dream of being able to offer a full spectrum of accommodation options and services that has expanded over many years. The complex comprises 86 independent-living units and a 98-bed aged-care facility in Boronia Heights, south of Brisbane. First-class living is one of the many attractions at St Paul de Chartres Residential Aged Care and Retirement Units. The facility has a unique architectural design and is set amongst peaceful surroundings of beautiful gardens and walkways with a backdrop of tranquil bushland. A spokesperson said the wellbeing of every resident “is enhanced by a range of services co-ordinated by dedicated nursing staff, lifestyle team and pastoral care workers within the aged-care facility”. The independent-living option offers affordable and convenient living for retirees with on-site facilities including a chapel with Mass celebrated daily, a spacious community centre, hairdressing salon, visiting doctors, overnight security and more.